Taking place in spring each year, English Tourism Week campaigns to raise the profile of the local industry and celebrate the value and quality of tourism in England. 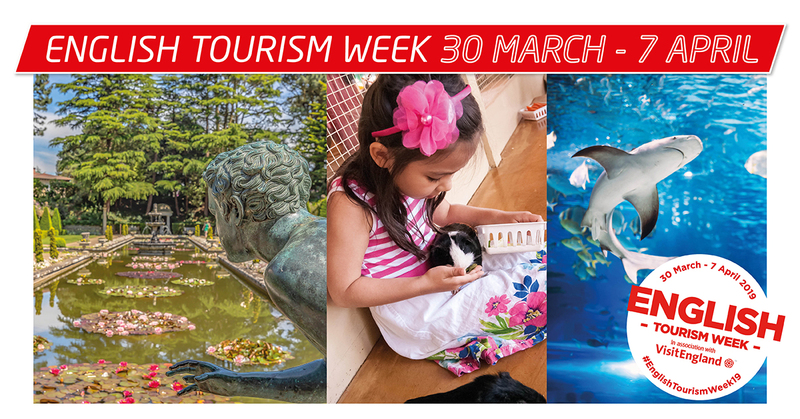 We have so many attractions to enjoy in our local area, hop on with us and let us take you on an adventure this week! We have compiled a list of some of our favourite places to visit. Purbeck is a rural district located in south Dorset and is home to some of the country’s most well-loved towns and landmarks including Swanage, Lulworth Cove, Corfe Castle and Durdle Door. Hop on our Purbeck Breezer for beautiful sights and divine local food – whatever you fancy, you will find something for everyone. At Tower Park, Poole, a galaxy of entertainment unfolds. With the Splashdown Water Park and Empire Cinema, Tenpin bowling, kid’s soft play, bingo and a range of restaurants, there's enough to keep you busy whatever the weather. The iconic Bournemouth Pier dates back to the mid-19th century and is still bursting with character. Over 300m in length, the pier is packed with all-weather entertainment from amusement arcades to adrenaline pumping activities. Rock Reef adventure centre offers pulse-racing activities for thrill-seekers of all ages and PierZip whizzes people on a zip wire 40ft above sea level, from pier to beach! After all that action, you’re sure to be hungry – luckily whatever you fancy, the pier will provide. Grab a coffee and sandwich, enjoy a traditional fish and chips or treat yourself to a cocktail at Aruba Restaurant and bar where you can enjoy 180-degree views of the town’s beautiful coastline. Castlepoint Shopping Centre has plenty of stylish shops for you to explore, so you're bound to find a bargain, and when you've shopped until you drop - replenish your energy at one of the nearby food outlets or why not head into Bournemouth for a bite to eat? You enter the cinema complex on the ground floor and from here you can pick up pre-ordered tickets from wall-mounted terminals, stock up on your cinema snacks and pop for a pre-film coffee in the Odeon’s very own branch of Costa Coffee. When it’s time for your film, head upstairs, perhaps picking up a drink from the licensed bar to take in with you (bottle of wine anyone?) and salivate over various hot food options including the novel ‘pizza and plank’ options. Farmer Palmers Farm Park is packed with fun-filled play and lots of cute and friendly animals! With attractions designed specifically with under 8s in mind, the park is guaranteed to keep your little ones entertained throughout your stay. Hop on the Purbeck Breezer 40 from Poole and get off right outside the door. Taking adventure golf to the next level. Book your family days out, couples date nights, children’s birthday parties, corporate events and Christmas parties. This unforgettable venue is jam-packed full of excitement as you are taken on a spectacular journey through a comic book, unearthly light experience and apocalyptic crash scene. Compton Acres boasts over 3000 species of plants, some which grow nowhere else in the county. With over 10 acres of gardens, Compton Acres is home to a magnificent collection of trees, shrubs and herbaceous plants. The gardens of Compton Acres are laid out on a circular route, rather like jewels on a necklace. This unique layout allows visitors to discover each of the gardens in turn. There is a step free route around the garden. Visit the market town of Lymington, located on the edge of the Lymington Estuary the town has a very nautical feel! Wander through the local salt marshes and enjoy the coastal scenery and wildlife before enjoying some traditional fish and chips in the marina. Saturday is market day in Lymington and it really brings the High Street to life! Get to Lymington on the X1 or X2 buses from Bournemouth. Why not delve a bit further? Home to Ringwood Brewery, a collection of designer and independent shops, large supermarkets including Sainsbury’s and Waitrose as well as an abundance of delightful cafes, Ringwood is a wonderful place to whittle away a few hours. Market day in Ringwood is a Wednesday, which is well worth a look. Get to Ringwood on the X3, X6, 38 buses and once there travel around town on the Ringo. The 18 hole mini course is at the heart of the Lower Gardens between Bournemouth pier and the main town centre. This classic course includes 12 accessible holes, which are suitable for people with reduced mobility or who use a wheelchair. Explore the treasures of Poole's historic quayside, delve deep into the heart of the Old Town and immerse yourself in Poole's fascinating history. Crabbing on Poole Quay is a must, as is sampling the delicious food and drink on offer in one of the many restaurants, cafe bars or traditional pubs whilst enjoying the splendid views across the harbour towards the National Trust's Brownsea Island. With its bustling atmosphere Poole Quay offers a great day out to suit all tastes. In the evenings there are plenty of bars and restaurants to enjoy.